Written by Janet Choi on March 24, 2015 . Communicating as a business can create a strange mental trap that makes you forget that you’re dealing with other human beings. You have relationships of all kinds, so you already understand two basic rules. One, relationships require management to develop, maintain, and strengthen over time. Two, how you interact depends on the stage or status of the relationship. You don’t make friends just by saying hello and never reaching out again, nor would you interact with a stranger at a party by treating them like your bestie. Why then do so many companies and organizations treat customer relationships so bizarrely? They may go for months without reaching out, or when they do, seem tone-deaf to reality, demanding attention and pretending you’re pals. Lifecycle emails are impactful exactly because they’re attuned to relationships. Unlike recurring newsletters or the worn out, indiscriminate email blast, lifecycle emails are “micro-targeted messages sen[t] to individual customers on the basis of where they, specifically, are in their relationship with you,” as Patrick McKenzie sums up so well. The guiding principle of lifecycle emails is to send the right message to the right people at the right time — based on what they’ve done (or haven’t done). Aligning all those elements to get everything right takes deliberate effort and planning, which can seem daunting when you think of all the flows and steps and people involved. In this guide, you’ll learn how to cut through the confusion to plan and create great lifecycle emails. Use Pirate Metrics as a framework. Create targeted emails using the 4Ws. Yeah, this blog post is pretty long! Save it for later to use while you’re planning your campaigns. Get a PDF version. 1. Map out key customer paths. many companies make the mistake of defining their lifecycle email efforts in terms of the emails themselves, rather than the relationship those emails exist to develop. You’ll need to understand the activity and status of your customers if you’re going to craft messages in terms of those relationships. At their best, lifecycle emails act like an extension of your product with the magical ability to reach beyond your app or site to get people to come back and make progress towards customer happiness. You probably have a good sense of customer behavior, from tracking data, support requests, user journeys and personas, and frameworks you already use to analyze and measure how your business is doing. Based on this data and knowledge, identify major turning points that impact user success and happiness. What are the high-value actions that get people hooked? Where are the drop-offs in activity? Where do people seem to get stuck and have that affect how long they stick around? How do previous steps in the path contribute to the drop-offs? Map out linear paths of how customers would ideally get from turning point A to point B to point C. These inflection points are opportunities to send a lifecycle email campaign to get people to perform desired actions and perform them sooner. For example, let’s look at the activation path of a new user for an imaginary work productivity app. We’ve concluded that there are 3 significant actions that we want new users to take after sign up after reviewing the behavior of our best customers. Sign up → Install → Create a board with at least 3 tasks → Invite teammates to a board Every point at which users are tasked with doing something significant is one where they may get stuck, bored, or busy and leave the app, never to return. Lifecycle emails will help ferry people along through those gaps. 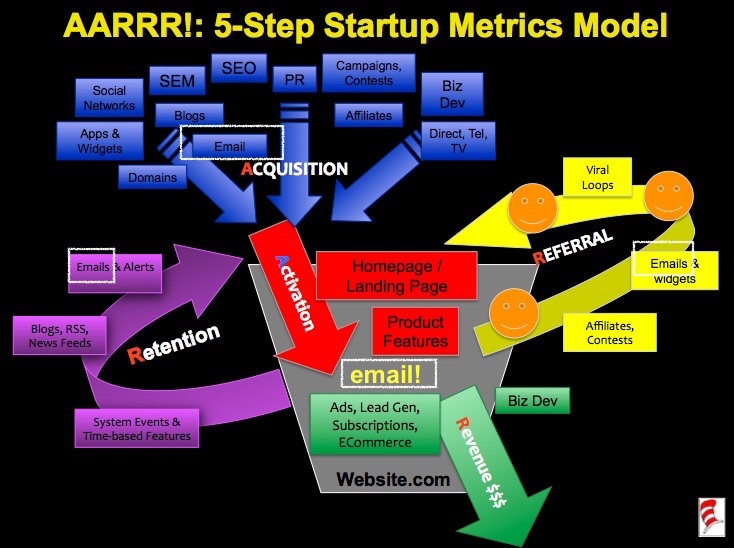 Dave McClure’s pirate metrics model provides a handy way to organize your customer lifecycle. Use the “AARRR” model to pinpoint major goals within each stage to incorporate into your customer journeys and consider what emails could nudge people from one step to the next. Acquisition: How do people find your site or app, and how does that affect their experience? Do you require people to put down a credit card to sign up? Do you want to create an educational email course? Activation: What step(s) do new users need to take to be successful or “activated“? Where are people getting stuck as they’re getting started? 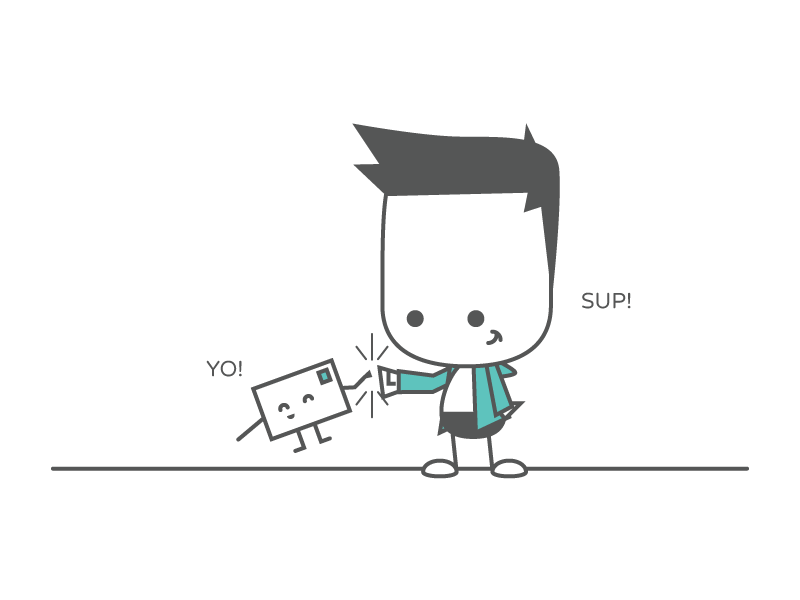 Retention: How do you get people to keep coming back and engaging with you? What do your best customers do? Is there recurring content such as blog posts, digests, and other types of customer activity reports to keep the relationship rolling? Referral: Do you have easy ways for happy customers to refer other people? Are there content or reports that customers can share that will strengthen word of mouth? Revenue: Revenue and billing is largely transactional but there are still lifecycle emails you can send around revenue goals, such as an annual billing offer or renewals. 2. Create targeted emails using the 4Ws. Now, what to write? Turn to our special lifecycle email formula: the 4Ws — why, who, when, what (and how). You already figured out the “where” of the emails, the placement within the customer flow. How many emails will make up a campaign for a particular goal? How should those emails be spaced out? You can work on your schedule and you’ll have a community of support. Now that you’ve made your point, give people a clear, compelling call to action. Is it clear what they should do next? Can you link to the spot on the site where the action should take place? 3. Putting it all together. 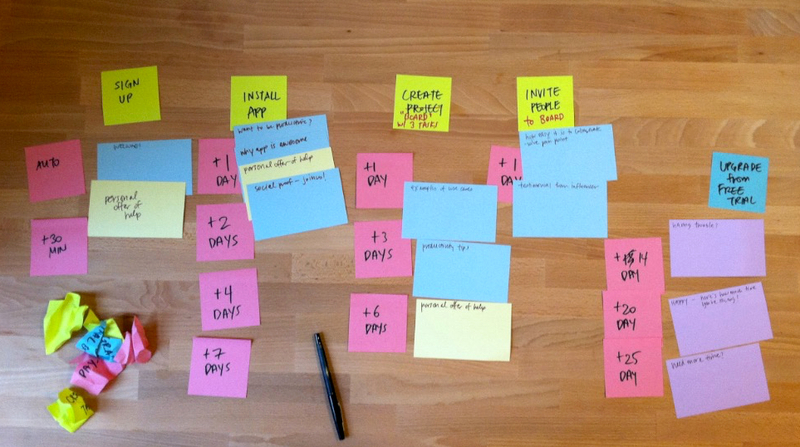 All this planning, mapping, and breaking down complex steps can get messy and confusing. Feel free to use your preferred tools for planning and organizing like flow charts, spreadsheets, or even Trello. Here’s a Google Sheets lifecycle email planner for you to copy and use! 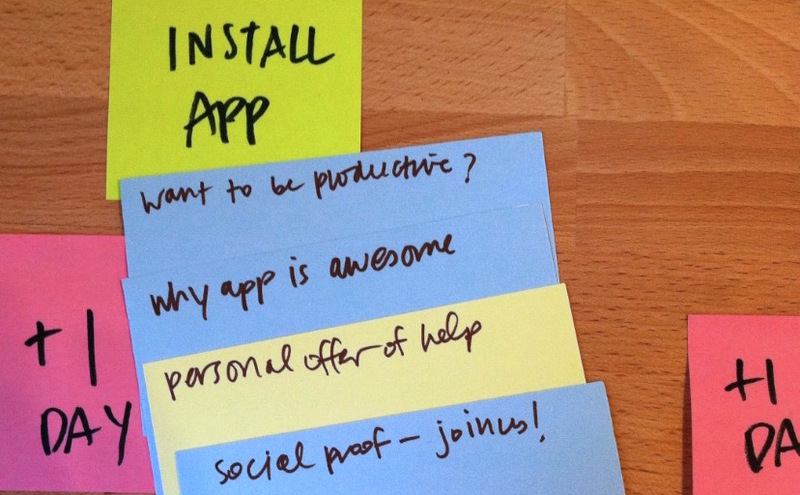 We suggest giving good old paper a go — nothing beats paper or cards for flexibility in brainstorming and organizing. Take the activation path shown above for the imaginary productivity app. 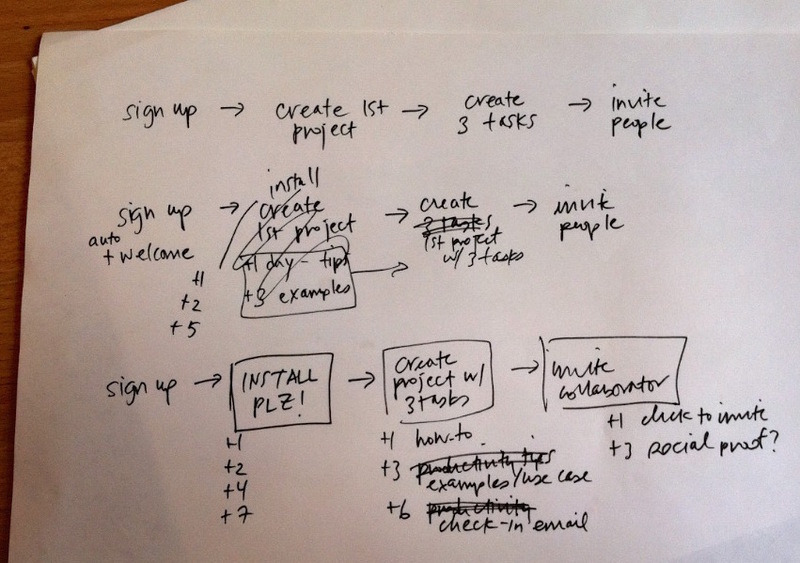 That’s usually the end result of a process that looks something like this: Simply sketch out your funnels, draft campaign ideas, and scribble email details on paper. Or use index cards and sticky notes with elements broken out into actions/steps, recipient segments, send delay, message approach, etc. When you’re able to break elements apart, it’s much easier to move things around, remove an element, and get a sense of the flow. Using index cards for emails is handy because you can jot down ideas for messaging and other notes as well. Despite their effectiveness, lifecycle emails are the kind of task that regularly falls off the to-do list, especially when there’s no one person or team dedicated to email. Don’t make that mistake — you can always start small. Like most projects, it’s actually more effective to work on lifecycle emails in smaller chunks. Remember, lifecycle emails are always work in progress anyway. Any maps, plans, and campaigns are living documents that you edit, adapt, and add to as time goes by, your products and users evolve, and you learn what works. A great place to start is, of course, at the beginning. This not only gets your first campaigns in place, it builds a customer relationship more naturally rather than having the purpose of your first communication be about a sale or an upgrade. 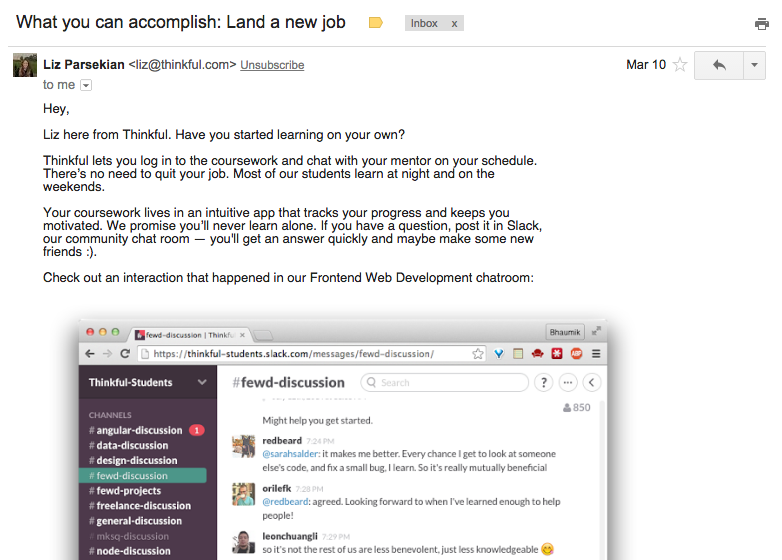 Create a great welcome email that every new user gets. Then you could tackle the following activation email campaign with 2-5 emails. This would only involve zooming in on your user onboarding and activation funnel rather than an entire customer lifecycle. There’s only so much you can plan for. Once you deploy your emails out into the real world, you’ll learn what works and what doesn’t work. You can also start testing elements like copy, subject lines, and timing to really get the most of your emails. So far we’ve discussed what you can tell your customers, but one of the greatest benefits of lifecycle emails is that they provide an open communication channel that works both ways. People can give you valuable feedback and ask questions, and you can find out more about your customers and their needs. Encourage questions and replies through any lifecycle. 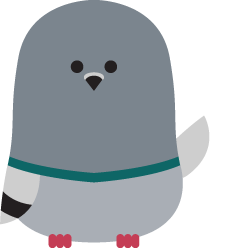 Work in offers and check-in emails to start conversations. Ask people why they’re having problems, or what makes them happy customers. Offer a trial extension or simply check in to start a conversation on why they’re stuck or not getting value.